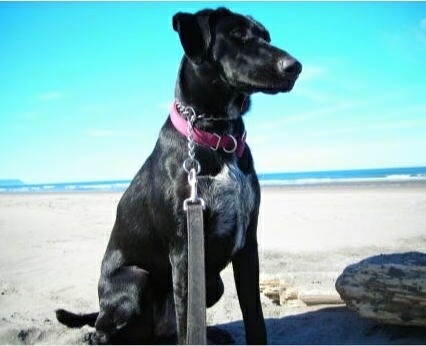 "This is Emmalou on the beach checking out the birds. Her mom's a pure German Wirehaired pointer and her dad is a pure Black Lab. She's a very vocal dog and likes playing fetch all the time." The German Wirehaired Lab is not a purebred dog. It is a cross between the German Wirehaired Pointer and the Labrador Retriever. The best way to determine the temperament of a mixed breed is to look up all breeds in the cross and know you can get any combination of any of the characteristics found in either breed. Not all of these designer hybrid dogs being bred are 50% purebred to 50% purebred. It is very common for breeders to breed multi-generation crosses. 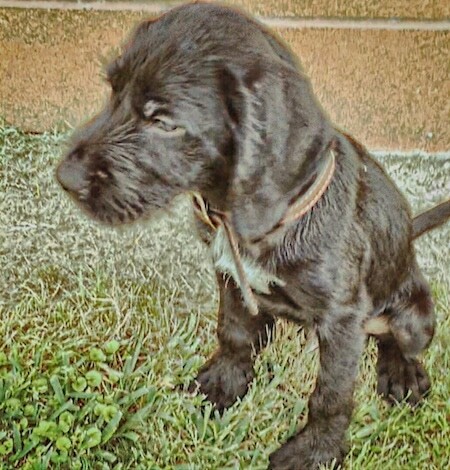 Maverick the German Wirehaired Lab as a puppy at 14 weeks old—"Maverick came from a pure bred black Labrador 3rd generation champion female and a North Dakota pure bred male GWP. Both natural hunters with great drive, very outgoing and social. Mav was retrieving at 8 weeks, bringing straight back to hand, super soft pup, and super soft mouth. He has learned each command within 2 training sessions of 15 min each. So I would say he is one heck of a smart pup. He already has a better nose then my 1 1/2 year old black Lab. He is always full of energy no matter how long I take him out for he seems to never get tired. He will be one heck of a bird dog in all aspects of the field." George the half German Wirehaired Pointer, half Labrador Retriever mix at 7 years old—"I got George when he was a 3-month-old puppy. He is a very, very loyal dog. He is maybe the best swimmer and tracker I have ever seen. He is great around people he and I know, but because he is very protective I can't allow strangers to approach him or I. We live in a R.V. and have traveled US for a long while. He is a dog that loves the woods and wilderness"